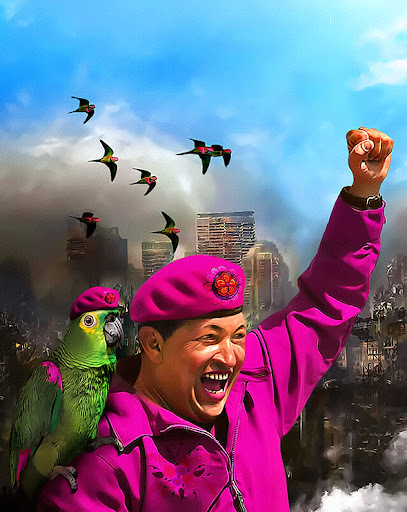 Venezuelan President Hugo Chavez's secret weapon, stealth parrots with diarrhea. Mr Chavez went on state television later in the day claiming that the coup leaders had taken away the Cuban ambassador to Honduras and left the Venezuelan ambassador by the road in the capital, Tegucigalpa, after beating him. He said that if troops enter his embassy "that military junta would be entering a de facto state of war," and "we would have to act militarily". Obama's Real Message to Latin America? Could the diplomatic thaw between Venezuela and the United States be coming to an abrupt end? At the recent Summit of the Americas held in Port of Spain, Barack Obama shook Venezuelan President Hugo Chávez’s hand and declared that he would pursue a less arrogant foreign policy towards Latin America. Building on that good will, Venezuela and the United States agreed to restore their ambassadors late last week. Such diplomatic overtures provided a stark contrast to the miserable state of relations during the Bush years: just nine months ago Venezuela expelled the U.S. envoy in a diplomatic tussle. At the time, Chávez said he kicked the U.S. ambassador out to demonstrate solidarity with left ally Bolivia, which had also expelled a top American diplomat after accusing him of blatant political interference in the Andean nation’s internal affairs.